When bringing a staged musical to the big screen several issues need to be resolved; from 360 degrees of shooting as opposed to one angle, to rewriting characters for film instead of live dramatized theatre, it can be difficult to get the story to read just right. Fortunately, Les Miserables is able to create a strong atmosphere that doesn’t seem forced or awkward. While the the direction of Tom Hooper fell flat, the strength of the vocals really define Les Mis as a successful film adaptation. 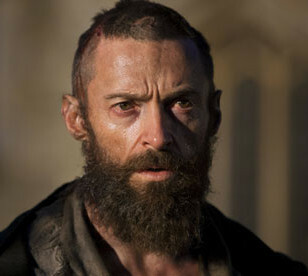 Based on the hit Broadway musical, which is in turn based off Victor Hugo’s 1862 French novel, Les Miserables tells the story of ex-prisoner Jean Valjean (Hugh Jackman) and his journey to escape the hindering life of a parolee. Constantly on the run from police inspector Javert (Russell Crowe), Valjean decides to take on a new identity as he starts a new life for himself, eventually becoming a town mayor. Without being recognized by Javert, Valjean rescues an injured prostitute, Fantine (Anne Hathaway), from the inspector’s arrest. 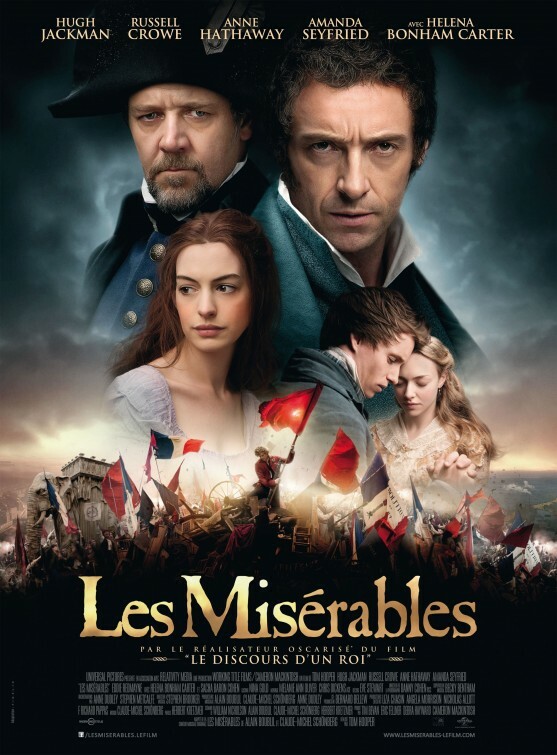 However, an unfortunate event leads to Valjean caring for Fantine’s daughter, Cosette (Isabelle Allen/Amanda Seyfried). Once Valjean hears of another man being arrested for his crimes, he must decide whether to give up his new life to save the innocent man or continue raising Cosette as a free man. Les Miserables is the heartbreaking story of love, loss, hope and misery set over several years during a period of the French Revolution. Though her screen time is brief, Anne Hathaway sure put on a show. Her training with legendary vocal coach Joan Lader months before filming allowed Hathaway to belt the end of “I Dreamed a Dream,” all while crying. 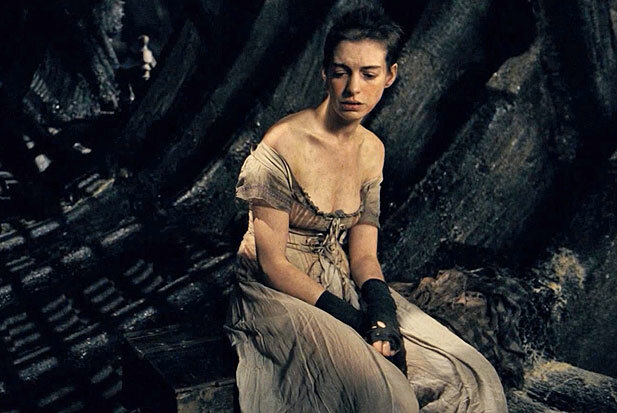 In an interview with WordAndFilm.com, Hathaway explains how hard it was for her to relate to the life full of loss and suffering that Fantine experiences; however, once she realized that sexual slavery exists even in our world today, she was able to consider her part not really as acting, but as her honoring the painful lives of the less fortunate. And it certainly showed. In just one take Anne created what was one of the most dramatic and saddening scenes in the film. I wouldn’t be shocked if she won the Oscar Best Supporting Actress. 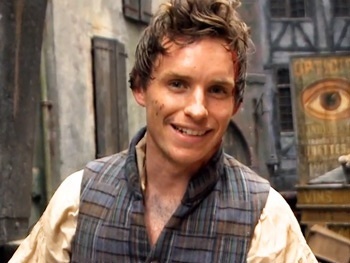 The absolute knock-out performance has got to be Eddie Redmayne. As an award winning Broadway star, it’s no wonder Redmayne thrived both vocally and theatrically as the love-struck Marius; his notes were strong, specifically his vibrato which was the most consistent of the entire cast. When singing with a lot of passion, several actors let the ends of their words trail off, but not Redmayne. He was able to maintain acute enunciations while still conveying Marius’ anarchist defiance during all of his songs. Not only was his singing phenomenal, but he also delivered his lines with all the moxie and showmanship you’d expect from a young revolutionary. While I’ve only seen Redmayne in Hick, which I hated, after this stellar performance, I’m definitely interested to see his future projects. 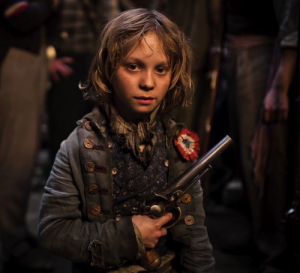 The other actor to look out for is definitely the 12-year-old virtually unknown actor Daniel Huttlestone as Gavroche, the street-smart helper of the revolutionaries. Any time he sang or spoke, I just kept thinking “Who is this kid!” Turns out Huttlestone has been doing live theatre since the age of nine, playing the role of ‘Nipper’ in the 2009 production of Oliver! at the Theatre Royal Drury Lane as well as playing Gavroche in Les Miserables at the Queen’s Theatre. Since the songs were sung live in the film rather than dubbed, I was dumbfounded as to how such a young actor was able to command such attention next to his supporting and leading cast. His talent was effortless, especially for singing so consistently while riding on the back of a carriage through cobble stone streets! While I thought it would be difficult to take such a well known character actor like Sacha Baron Cohen seriously (thanks to Borat, Bruno, and Da Ali G Show), I was pleasantly surprised to find Cohen’s acting a bit more subtle. Paired with the always amazing Helena Bonham Carter, the couple was hilarious as the money-hungry watchers of Cosette. The slapstick, obnoxious and cheeky duo were risqué enough to not draw too much attention to themselves while still providing nearly the only comedic moments in the somber film. Cohen and Carter also starred opposite each other in another musical-turned-film titled Sweeney Todd. It’s obvious that the two gel together in their back and forth dialogue on screen. Hugh Jackman and Russell Crowe were by no means bad; their acting was convincing and generally true to the characters, but their vocals were lacking. As the two main characters, Jackman and Crowe sing the most but struggled with notes and pitches. Jackman had a few noticeably off moments intermittent of his fairly strong vocals, but they were there. Although not detrimental to the film or his character, if you had seen him as Jean Valjean on Broadway, you’d be pissed. Crowe on the other hand was able to sing with a little more consistency, although Javert’s songs were hardly as challenging as Valjeans. I felt his singing was true to his character and didn’t seem forced, but they also didn’t seem Broadway worthy. I can understand that it’s hard to follow in professional Broadway singers’ footsteps who often ooze perfection, but in comparison to the rest of the casts’ vocals, these two were noticeably weaker. Director Tom Hooper is known for his signature framing techniques and varying focal lengths which have been successful in films such as John Adams and The King’s Speech. Unfortunately, some of his extreme angles were overshadowed by stagnant, extreme close-ups during solo ballads in Les Miserables. In many instances, the camera would simply stop for what seemed like minutes at a time, focusing on just one character’s face while they sang. It became predictable and really slowed down the film’s pace. Cinematographer Danny Cohen worked with Hooper on The King’s Speech which earned him an Oscar nomination for Best Cinematographer but he really flopped with Les Mis. There were a few saving graces, such as when the camera would pan out from the close up of a character’s eyelashes all the way to a huge landscape, but it was the scenes during solo songs where I got lost and bored. The film was so full of strong voices and scenery, that I didn’t understand the purpose of stillness. In short, the cinematography failed to translate the live theater aspect into film in a successful way. Above all, Les Miserables is a musical so there should be a sense of a grand orchestra, and this film was lacking in that department. While the music was great and the score was nicely inserted, more could’ve been done with the orchestra. In a film you have the option of surround sound, and for something with so many instruments involved, I can’t imagine why it wasn’t utilized. The powerful moments of music, whether vocal or background sound, was held back, and as a result, the film lacked the grand feeling of a true musical. I was expecting varying levels of sound to show emphasis and build suspense, but instead was left with mostly middle volumes the entire time. I wanted to feel like the orchestra was surrounding me, but the orchestra seemed detached from the story and its characters. All in all, Les Miserables is definitely a very good movie, but with all the hype I was a bit underwhelmed. Overall, the vocals are strong as was the acting, and with a cast that size, I was impressed with the apparent camaraderie. Unfortunately, Hooper seems to have been a mismatched choice for the film and his style often took away from some of the more successful elements. Les Miserables will make you cry if you let it, but it will also make you smile and want to keep watching. 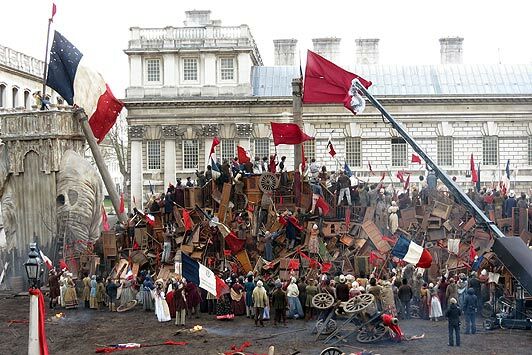 Despite some of the film’s downfalls, Les Mis will definitely earn several Oscar nominations. Ok, well obviously you aren’t a trained musician or theatre lover. I realize everyone is entitled to his/her own opinion, however, you definately missed the mark on this review. To call Hugh Jackman’s performance “Ok” is not ok. If you are going to criticize someone for poor vocals, give that award to Amanda Seyfried. Her horrible vibrato wasn’t even mentioned in your review. 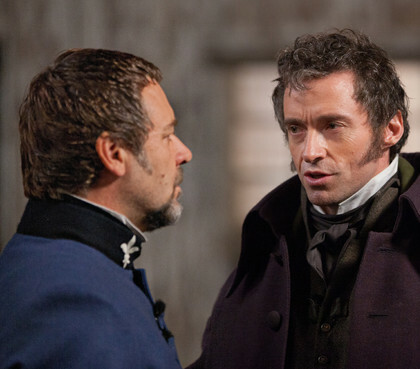 Jackman is a trained, award-winning Broadway actor. His performance was incredible. Russell Crowe deserves the “Ok” but Jackman and him do not deserve to be on the same level. In regards to your comments about the orchestra, this score was written over 25 years ago when the musical was first introduced. The “grandiose” of this musical is found within the performances of its actors as well as the orchestra score. From the first time I saw this musical I was blown away by the music, and this movie did a wonderful job translating it onto the screen. This review just scratches the surface of the movie and its performances. As an avid reader of Reel Movie Nation, I am used to better reviews and better grammar (holy crap, avoid run on sentences.) Please go see this movie again. Actually, I am both a singer and an avid theatre buff, which is why I was even more let down with Jackman. If you think his performance was flawless, you are surely mistaken. Several other film critics have not only agreed with me, but have had even worse things to say. I stand by saying that he was not bad, but I didn’t appreciate some of his choices. I am not as easily impressed as the typical film goer, because I believe I have a duty to my audience. It’s obvious that not everyone shares your opinion, and that Jackman’s performance was not 100% spot on. Like I said, as a film critic, I owe it to my audience to not be so easily impressed. Jackman’s performance was obviously not a 100% hit for all. As for your other comments, I only have limited space for my review, so I choose things that were more “make and break” for the film. Seyfried I thought was decent, but not the strongest or weakest part. If you read most critics reviews, her vocals are praised. I disagree with your diagnosis of the lack of grandeur, as I’ve seen the live musical and I think the orchestra gels with the visuals much better. It’s one of the issues with placing an opera musical on screen, but I’ve seen it more successfully done and thus hold it to a high standard as well. For grammar and run on sentences, feel free to email our editors, we are always trying to make the site better. But those are things done in post-writing, I never use semi colons if that gives you any indication of the editors style. I will absolutely see this film many more times, but perhaps you should also see what others are saying on the film before you jump to the conclusions you seem to so strongly feel. I don’t know your background in vocals or theater, but I didn’t write my review as someone with specific interests. I write as a common movie goer with high standards in all aspects of the film, as I think I owe it to our audience to do so. Thanks again for reading, and we always appreciate feedback, positive or negative!!! Do you think sighting other critics gives you an edge? I never once said Jackman’s performance was “flawless” as you misquote me (feel free to re-read my previous comment for clarification). As for grammar and run on sentences, do not blame your poor writing on the editors of the website. I am appalled that you would respond to a reader in such a disrespectful manner. Your need to “one-up” me is evident. Please learn how to respond to the readers of this website in a more respectful way. I think sighting other critics shows that your opinion doesn’t mean my opinion is wrong. You questioned my judgement, and it is not my judgement alone. This is evident by many other critics having the same opinion. If you want to pick at specifics, I didn’t quote you. I didn’t say “you said”, so please take time to read exactly what you’re responding to. I said, “if you think”. My whole point was Jackman’s performance was good, it just wasn’t as excellent as I’d hoped. To actually quote you, you said, “to call Jackman’s performance OK is not OK”, but there are many other critics who disagree with you too. I’m sorry that the support of my opinion by others offends you, but unfortunately, I can’t control that. Thank you for your continued disrespect. I look foward to emailing the editor and expressing my opinion on the matter to him. Welcome to the world, where not everyone will agree with your opinion. If you have a problem with that, the MATURE way is to handle it with grace and dignty. THE END. lol you’re the one who said i didn’t have any musical training and wasn’t a theater lover. If you’re the one who starts being disrespectful, you can’t get irritated when you are proved wrong. You were disrespectful from the start. Then you were proved wrong. This is a place to share your opinions on film, not comment on punctuation and grammar when you couldn’t even spell “definitely” correct. (“definately” is wrong). Everyone will be wrong at some point in their lives, and you just happened to voice your opinion in public. Again, I apologize that you were offended that others supported my opinion. I’m very receptive to people when they have differing opinions from my own, but they way you presented yours was an unnecessary and personal attack. Most importantly, an unwarranted attack in which others supported my opinion. You are absolutely allowed to have your own opinion, we encourage it. But perhaps if you had simply stated your thoughts on the film, instead of attacking a writer personally, you wouldn’t have been so upset when there were other writers who agreed. I love discussing film, not my personal qualifications. As mentioned, it really does stink to be wrong, but perhaps this will be a learning experience for you. Alrighty. Enough is enough. I don’t understand how this turned into a petty catfight, but it’s gotten ridiculous. Ghost, it was wrong of you to question Jess’s credentials. Jess, it was wrong of you to cite other people instead of finding examples within the film. Throwing other writers in someone’s face doesn’t invite discussion. No one person is right or wrong in this situation. It is all a matter of opinion. You are both obviously passionate about the film. So let’s have a mature and polite discussion, starting now. Clean slate. I truly enjoyed Hugh Jackman’s performance on “Who Am I” and during other moments in the film. I suppose that made up for his rather mediocre showing on “Bring Him Home”. Russell Crowe didn’t really have a moment where I said “wow”. Thank goodness for honest critics,never mind critics who will go to the trouble of replying to angry fan boys/girls. And thank goodness for a gaggle of honest critics. Such things are worth qouting. The only thing between us the paying public and total corporate media money interested poor quality, artistically feeble rubbish cinema and art in general, are the honest critics. I prefer dr who style myself, better to get em before not after, as some things are easy to see in the past before the present. I found High Jackmans acting to be terrible never mind his singing, which like his acting was over dramatic and wafull.But of course he WAS the leading man, so the money interest had to make sure they had a ganag of brown noses with a voice in the money controlled media prasing him, same goes for The worst A list none actor in the history of cinema, Sacha Baron Cohen. Of course the other thing is artistic integrity, but it seems there is not much of that these days, so time travelling critics are our only hope.